This is one my favourite photos. If you look hard you can even see the bees’ wings vibrating. And yes, for those who come here often, I know I’ve posted it a few times before. 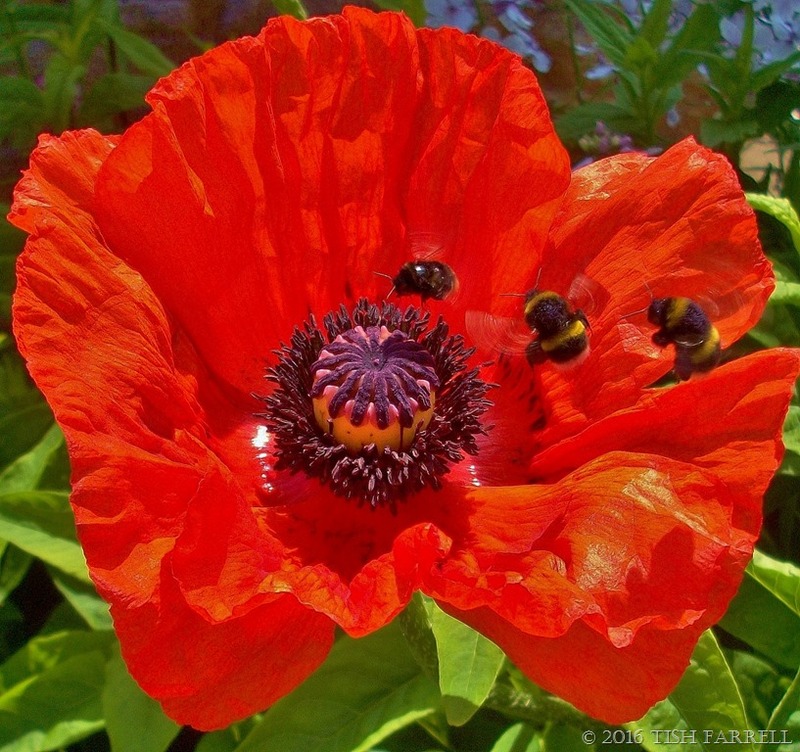 But isn’t it joyous – hot red, buzzing bees, sunshine. All of which is to say we need to keep thinking about bees. We cannot do without them. 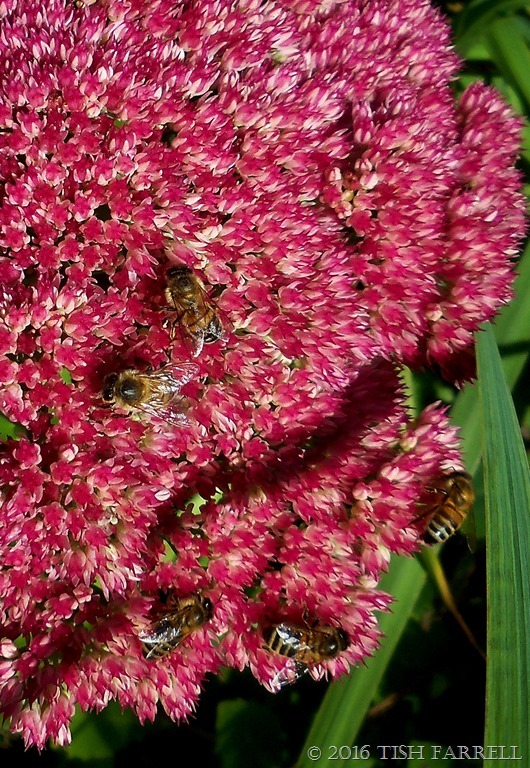 They pollinate many of the plants that provide us with essential foods. In the northern hemisphere new seeds are coming into the shops, so we can all think about sowing some bee-friendly flowers. You don’t need a garden. A pot of oregano will please them, and make you happy too when you’re making spaghetti sauce. If you want to find out which plants are bee friendly, there are many bee sites on the web. But for local first-hand information ask your local beekeepers society. There will be one. Meanwhile the Royal Horticultural Society provides some useful guidance if you want to give your life and bee-life lots more buzz. 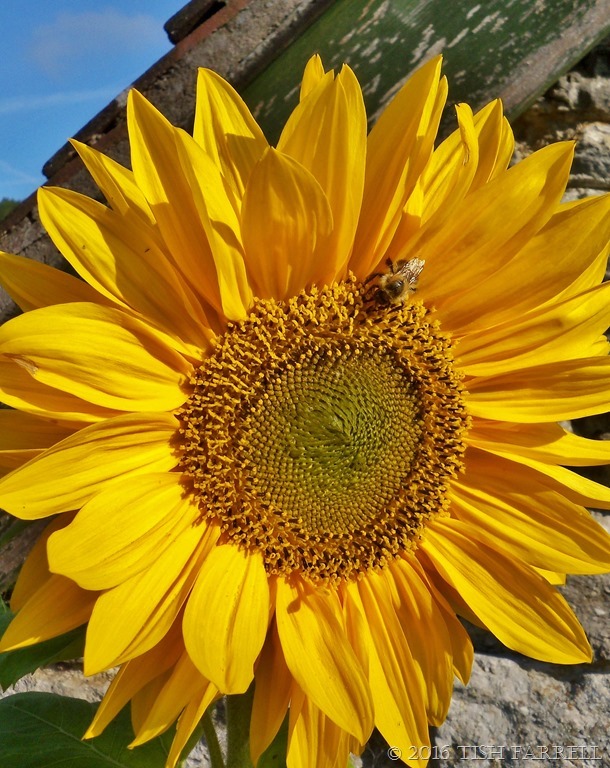 Posted on February 3, 2016 February 3, 2016 by Tish Farrell	This entry was posted in Environment, photography and tagged #SaveBees, #vibrant, bees, DP weekly photo challenge, Tish Farrell Writer. Bookmark the permalink. Happy to cheer up the greyness, Janet. Colour recharging the brain – an area in which you are definitely the past master in all you create. Oh yes. A good reminder. Your African bees have a very short fuse if disturbed in ways they don’t care for. Cheers, Noel. This, what a stunning collection … And we do need bees and the right plants help. I’ve been delighted her to notice that we seem to be getting more than we’ve had a few years, which might have been due to our five year drought. I don’t know if we’re through that but we have been getting a fair amount of rain as yet. Time will tell if it’s enough to pull us out. Tish, “The BeZine” theme for February is “All God’s Creatures” … I would love to include this if it works for you. I think I already have your bio. If it would be okay, would you let me know at bardogroup@gmail.com? Include the link. I can pull it down so you don’t have to include the narrative or photos. Thank you. Let me know … and Thank you! for giving bees the right-up they deserve and us a reminder. J. Thanks, Jamie. Am more than happy for you to include this. I’ll email you. Fab Tish, love them all. Unlike, Mak, I have never encountered an angry bee. Maybe the species we get at the Ark’s spot are different? But I feel quite safe standing shoulder deep among the cosmos merrily snapping away while the bees go about their business. We dont get the species in your photos down here. I read somewhere that a few studies have shown that introducing non local species to an area in an effort to thwart or offset radical destruction of local bee populations has in some cases had negative results, with the introduced species almost completely supplanting the locals. We do so like to meddle, do we not? Yes, too much meddling on too many fronts, I’d say. En passant of which, I read the other day that in the US, GM alfalfa has, contrary to its developers’ expections gone wild, and causing lots of expensive problems to non GM alfalfa farmers. Nothing like the soothing sounds of bee hum, Sylvia. I agree. This is the first time I’ve seen these images, they are truly magnificent. Bravo for the bees! Such beautiful and vibrant flowers. There’s been a couple of bees in my garden through the winter. Brave bees. I suppose there have been a few flowers out all winter too, now I think about it. Lovely photos and a great reminder of bees importance. 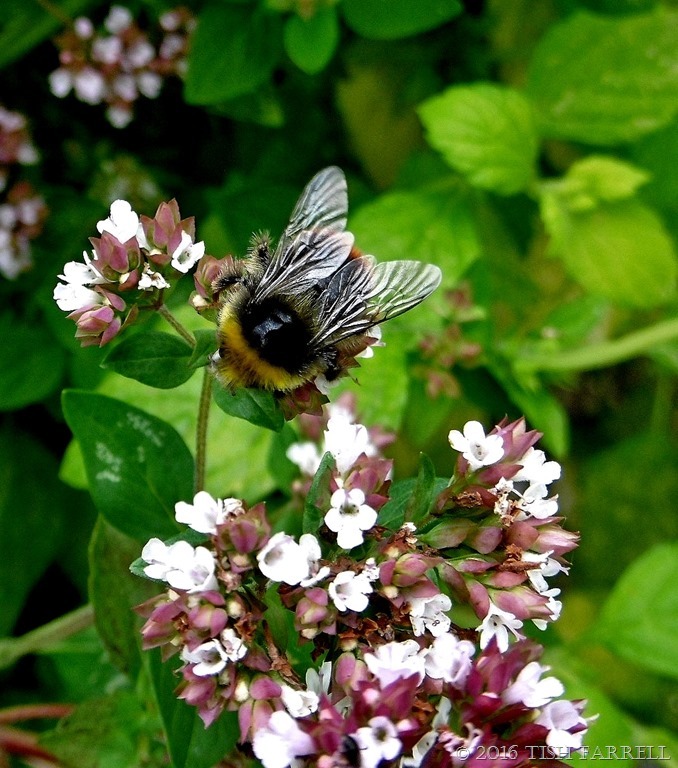 I didn’t know oregano was bee-licious; I’m very glad I planted some. Really gorgeous, Tish ! The more I observe the photos the more I enjoy them! Wow! Love the detail and the vibrancy of the flowers. Great capture of the bees! 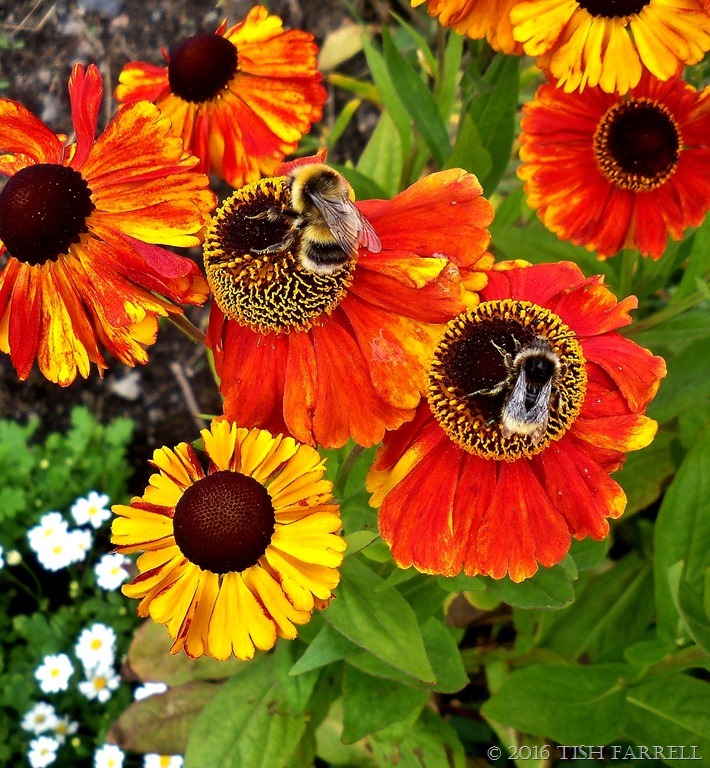 I never get tired of seeing your beautiful vibrant photos of the bees busily buzzing. 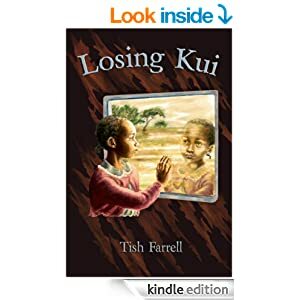 Beautifully captured, Tish. We’re in the middle of a particularly overcast period — it’s called winter — and photos with such vibrant colors are greatly appreciated. Over this side of the Atlantic we’re getting very surprised if we see the sun at all. All this El Nino effect is a bit lowering. Glad the pix added a bit of light. These are so vibrant and so perfectly captured. I wish I had seen them sooner. I agree with you, Tish. This is certainly one of your most attractive and smile provoking posts. Well thank you for visiting my ‘back catalogue’, Paula.